Brown Bear or Grizzly: What’s in a Name? It’s a trick question. Sort of. Across most of the world, people use the common name brown bear to refer to the species Ursus arctos, one of Earth’s eight living species of bear. All sharing the same scientific name, brown bears live across parts of northern Eurasia and North America, from China to Scandinavia to Canada. Known for their muscular humped shoulders, long claws, dish-shaped faces and fur ranging from blonde to dark brown or even black, Ursus arctos is an opportunistic omnivore and scavenger. Its diet, and thus its size, varies widely to match its surrounding environment, with the largest brown bears rivaling polar bears in size. The species’ adaptability has led biological taxonomists to designate various geographic subspecies of brown bear over time, some of which are more familiar to the general public than others. 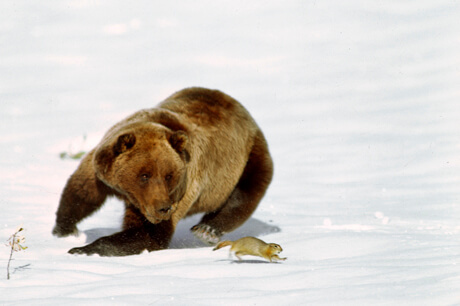 In North America, the grizzly and Kodiak bear are the most widely-recognized subspecies of brown bear. Grizzlies are inland brown bears. They once lived across western North America’s mountains and prairies, from the Alaskan tundra to the Great Plains and the high peaks of Mexico. Now, after a century of habitat loss and other pressures, they roam only Alaska, parts of western Canada, and isolated pockets of the northwestern United States. Unlike coastal brown bears, most grizzlies rely on a diet of berries, roots, grubs, moths and occasionally larger animals. As master scavengers, many grizzlies supplement a plant-based diet by feeding on the remains of animals killed by other means. While their brown bear cousins near the ocean feast on salmon and other fish, sometimes growing as large as 1,000 pounds in the process, inland grizzlies are generally a bit smaller, although their size still depends greatly on diet. 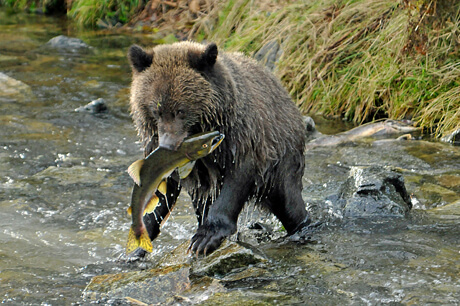 Adult grizzlies’ fur often bears a trademark grizzled or silver-tipped appearance while coastal brown bears are typically darker-hued. Another widely-recognized subspecies of brown bear is the Kodiak bear, referring to the bears that have lived in genetic isolation for centuries on Southwest Alaska’s Kodiak, Afognak and Shuyak islands. On average, these giants are the world’s largest brown bears, thanks to their rich fish-based diets and dominance within their island food webs. Maybe you’ve heard of one of the biggest (1,500 pounds!) and most famous Kodiak bears in history—Bart the Bear, co-founder and original animal ambassador of Vital Ground. So, I See A Brown Bear – What Should I Call It? Well, that depends. Assuming it’s not a black bear with brown fur (in case this wasn’t confusing enough), what you call a brown bear depends on where you are. Up in the mountains or out on the prairie or tundra? It’s a grizzly! Down on the coast watching a bear catch fish? Stick to the name brown bear. In Montana, we love the name grizzly so much we gave it to one of our flagship university’s athletic teams. But if you travel to Southeast Alaska or British Columbia and start throwing around the word “grizzly,” you’re bound to have someone correct you. Meanwhile, most scientists stick to calling all members of Ursus arctos brown bears, regardless of location, just to avoid confusion. Of course, before you worry about what to call any bear, you should make sure you’re being bear aware! If we’re going to share the Earth with these magnificent animals for generations to come, we’ve got to be smart about it. Now that you know what to call the big bruins, brush up on your bear safety essentials and learn more about how you can help the Great Bear today!